To perform the Periacetabular osteotomy with the Guiding Star navigation and the TOCOS module a surgeon has to follow a few steps. In the first step, the surgeon has to plan the cutting directions around the acetabul with the EBS preoperative planning software. In the second step he has to transfer the pre-planned cutting direction and printed plastic templates to the Guiding Star navigation platform where the CHISEL is navigated around the 3D patient specific anatomical model. 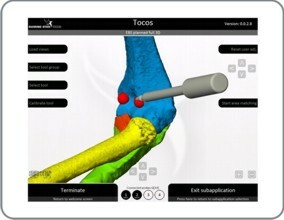 For the open surgery of elbow stiffness the Hi Speed Power systems can be navigated using the Guiding Star navigation platform and the TOCOS module. The surgeon has to plan the location and depth of cutting and transferring this to the navigation tool.